We learned yesterday that the Silver Birch Press SILVER ANTHOLOGY (released in November 2012) has been nominated for the Best Mixed Anthology by readers of the UK site Sabotage: Reviews of the Ephemeral. If you would like to vote, you can find the link on this page (When you get to the survey, the Mixed Anthology category is #3 on the list). You can vote until May 1, 2013. 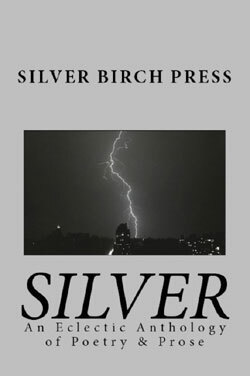 Congratulations to everyone whose poetry and prose appeared in the SILVER ANTHOLOGY — including many authors from the UK! Best wishes to: BARBARA ALFARO, JENA ARDELL, MELISSA BERRY, JANE BUEL BRADLEY, JOHN BRANTINGHAM, RACHEL CAREY, CHIWAN CHOI, BILLY COOK, BARBARA DAHL, WALTER DE LA MARE, COLLEEN DELEGAN, GILLIAN EATON, BARBARA EKNOIAN, MERRILL FARNSWORTH, SYED AFZAL HAIDER, JOE HAKIM, ANDREW HILBERT, DONNA HILBERT, GAIA HOLMES, ZACK HUNTER, DIANE EAGLE KATAOKA, RUTH MOON KEMPHER, LINDA KING, THOMAS KUDLA, MORIAH LACHAPELL, LEEANNE MCILROY LANGTON, VICKIE LESTER, ELLARAINE LOCKIE, GERALD LOCKLIN, AMY LOWELL, SANDYLEE MACCOBY, TAMARA MADISON, CLINT MARGRAVE, DANIEL MCGINN, MARCIA MEARA, ANN MENEBROKER, JACK MICHELINE, BEN MYERS, JAX NTP, HANK PERRITT, MEGHAN PINSON, JACKIE PLEDGER-SKWERSKI, KATHY DAHMS ROGERS, CONRAD ROMO, LUKE SALAZAR, JOAN JOBE SMITH, CLIFTON SNIDER, DALE SPROWL, KENDALL STEINLE, ADELLE STRIPE, PAUL KAREEM TAYYAR, KATI THOMSON, JERI THOMPSON, WINSTON TONG, MARGARET TOWNER, MARY UMANS, DIRK VELVET, MELANIE VILLINES, FRED VOSS, MARK WEBER, TIM WELLS, STEVE WILLIAMS, and PAMELA MILLER WOOD. Special thanks to SILVER ANTHOLOGY co-editor Joan Jobe Smith for inviting so many of the authors she’s met during her UK visits to participate in the Silver Birch Press anthologies. Congratulations. Well-deserved. I always look forward to seeing Silver Birch Press in my in-box. Super news, SBP! Congratulations to you and to all the contributors! And just wait until they see the Green anthology! Way to go!! Wow! This is wonderful and yes, I just voted.